Hey everyone! I've created a workflow that allows you to search and create notes for Bear. This is my first workflow, first OSS project, and first foray into Python - let me know what all I messed up Available on github and Packal. Many thanks to @deanishe and @dfay for some initial direction. To install, download a released alfred-bear workflow and double-click to open in Alfred 3. Easy-peasy. bs -- Search for a note by title and open it in Bear. 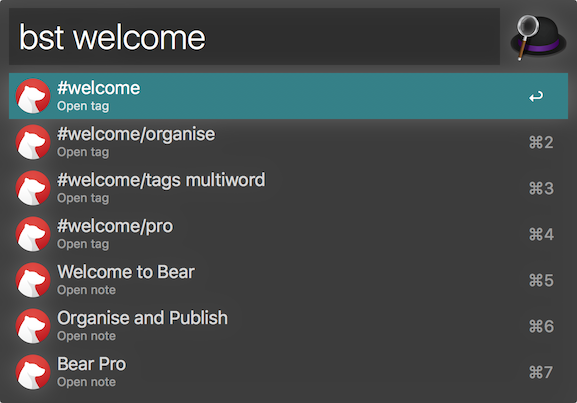 bst -- Search for a tag (a group of notes) by tag title and open it in Bear. bn I love notes! -- Creates a new note with the title and text "I love notes!" bn I love notes! #love #notes -- Creates a new note with the title and text "I love notes!" and the tags "#love" and "#notes"
Creating tags only works with single-word tags - multiword tags hopefully to come. Append text to existing notes. deanishe for guidance on Alfred workflow creation and capabilities, and for his excellent Python workflow library. dfay for guidance from his experience writing the Ulysses Alfred workflow. Rhyd Lewis for giving me an excellent example to work off of in his Omnifocus Alfred workflow. Fixed database location that changed with a Bear update. Added search results from note text to main search. Changed search queries to order by last modified date descending, so that more recently modified notes/tags show up at the top. Added hashtag symbol to "Open Tag" list results to make it a little more obvious that it's a tag and not a note. Searching by tag now displays not only tags that match the search query, but notes that match those tags as well. Searching by tag now works with or without the '#' symbol in front of the tag. @td. As a rule, pictures aren't much help with trying to diagnose and fix problems. At a minimum, please also include any output in Alfred's debugger. Thanks for the heads up, y'all! I hadn't updated Bear yet with its recent update so hadn't detected it yet. Sure enough, upgrading in the App Store broke it. Let me hack up a fix real quick and release it. Or is it a known issue or even by design? Ok, nice Let me chip in some ideas if you like. 2. Automatically insert two breaks after the tag like in the following image. That's my default layout and I assume the one from the majority? Maybe, I don’t know! 3. Show tag suggestions as soon as you type # like in bs. That would be awesome! Yeah, that’s it for now. Nice that you are so responsive! @td. Thank you for the suggestions! I think they're great ideas that I'd like to implement, so I've created enhancement issues on Github to track them. A couple sound tricky but I do love a good challenge. Feel free to reach out to me if you ever have any other ideas! Thanks for the workflow, this is exactly what I was looking for! Maybe I'm finally ready to transfer my recipe bookmarks from browser to Bear as I'm able to search for them properly. BTW I had the same error than Jakub here before me and I thought the workflow is just broken. Now after few weeks I decided to try again and it works like a charm! What changed in between? I went Pro! Maybe that could affect this workflow? Not sure though, but if that's the problem you might want to add a note about it in Github. I second this suggestion. This is exactly the way I do my notes. Great workflow! I'm not sure if anyone else has run into this, but it seems like the ability to open a tag in bear does not work if a tag has spaces in it. I'm guessing something's not getting encoded properly somewhere?